The girls played very well. We set goals for them being that it is a 17's tournament. They reached our goals and dominated the whole day. The girls played very well. We set goals for them being that it's a 17's tournament. The team pretty much reached our goals. 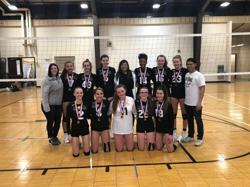 15 Gold dominated all day. ©2019 MOVA Volleyball Club / SportsEngine. All Rights Reserved.